In Class B motorhome ownership, compromise comes with the territory. Owners often trade room and some amenities for better mileage and manageability, and they’ve come to expect effective use of space. As a leader in the Class B motorhome market for more than 20 years, Roadtrek knows a thing or two about design, engineering and functionality — and according to the company, the 210-Popular model is the ultimate fusion of all three. With the Chevrolet Express extended van as its base, the widebody 210-Popular is stretched to almost 22 feet, creating room for more of just about everything. Looking to the rear of the 201-Popular gives a sense of the smart design. The 210 boasts more space in its permanently enclosed bathroom, 74 inches of headroom throughout and more storage — 74 cubic feet of it. For easier loading and better air circulation, Kitchener, Ontario, Canada-based Roadtrek retained the Chevy’s side entry door. The 155-inch wheelbase provides for a smooth ride and easy handling, according to Roadtrek, and the body is made of fully painted, steel-cage-reinforced fiberglass. Fuel economy is another area where the 210-Popular does more, as Roadtrek Co-chairman Jeff Hanemaayer said owners report getting around 15 mpg on the highway. When it comes to options for the 210, the list is surprisingly short — but that’s only because the list of standard features is so long. Starting up front, this well-equipped Class B comes with a removable turn-by-turn GPS navigation system, iPod and Bluetooth phone interfaces, and a backup camera with remote and motorized 4.3-inch LCD screen. These features are in addition to the in-dash AM/FM satellite radio and CD, MP3 and DVD players. The 210-Popular comes standard with two twin beds. Comfort also comes standard, as the 210 includes a 120-volt AC Dometic air conditioner and heat pump, box awning for those who like to entertain and faux leather seating for five. The galley boasts granite countertops, stainless steel sink, recessed two-burner stove with flush cover, a microwave/convection oven and 5-cubic-foot refrigerator; a built-in coffeemaker is optional. The 210’s bathroom offers complete privacy. It features a foot pedal flush toilet, vanity sink with storage cabinet, mirror and 120-volt AC receptacle. Use the shower sitting down with the door closed or as a stand-up shower in the aisle. The average length is 16 to 21 feet and the average height is 7 to 8 feet. Towing capacity is 6,000 to 8,000 pounds on average. 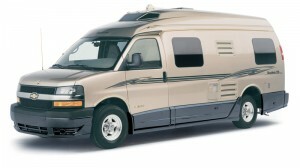 Class B’s are versatility while providing self-contained motorhome attributes. They are easy to drive, park and can fit in smaller off-road spots that are too hard or impossible to get to with larger Class C motorhomes. Class B’s offer great gas mileage, they are fast on the road, and easy to find parts and mechanics for. Easy to drive on highway and around town. 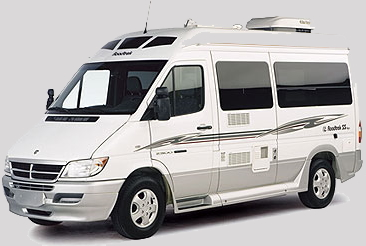 This RV is constructed from a van, so it is just as easy to drive. Driving and living compartments are connected. No need to get out of the RV during stops. Living area accessible even while moving. It can be used as local transportation. Can tow a small trailer, boat or support a carrying platform on hitch receiver. Can be used as a second family car when not traveling. Requires no special storage when not in use. Fits in standard driveway and lower models may fit in the garage. Can go off road if equipped with four wheel drive. Limited space, practical only for short trips. Accommodates a small number of travelers; usually two, but not more than four. Based on square footage costs they are the most expensive RV’s to own.